If the Grand Rapids Public Schools’ Museum School is anything like the week she spent with students at the Grand Rapids Public Museum last year, fifth-grade teacher Abbie Marr said students and parents should expect great things. Marr, who teaches at Harrison Park Elementary School, was among a group of GRPS teachers who used the museum as a classroom for some 300 students during the district’s Immerse program last year. 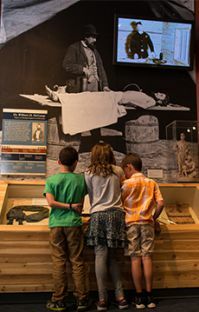 The week-long experience allowed students and teachers nearly full access to exhibits and archives as teaching tools, and is a forerunner of the Museum School slated to open next school year. Aside from the unique learning space and its partnership with the museum, the district also is partnering with Grand Valley State University, Kendall College of Art and Design of Ferris State University and Downtown Grand Rapids Inc., which for the first time has included a school in itsdowntown master plan. Also in the mix is the city’s Downtown Development Authority which has put up $20,000 in planning for the effort. Those behind the new school approved by the school board Sept. 2 say the partnerships will make available a broad spectrum of expertise and resources unheard of in other schools. Marr noted the district’s other schools in community cultural organizations like those at Blandford Nature Center and the John Ball Zoo have met with great success. She said she expects the new school will spark a new vibrancy among students and teachers using a new way of learning every school day. “For teachers it’s amazing to teach in a program that uses a new and different way of teaching. I think that’s going to bring a lot to the table for the kids that their teachers are rejuvenated,” Marr said. Mike Posthumus, assistant director of The Center for Educational Partnerships in GVSU’s College of Education, said being able to use the museum’s collection as a gateway for curiosity and wonder will make learning far less abstract and much more real to students. The ability to even touch artifacts is expected to drive home lessons in ways reading about it simply can’t. 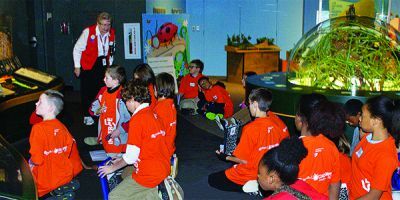 “When I ask parents what they remember most about school, they typically will tell you they remember the time they went to this place or on a cool field trip,” said Posthumus who is helping to develop the school’s curriculum. “This school will be completely built around those types of experiences — focused around the most memorable and engaging things about education. Museum President Dale Robertson noted in some ways the new Museum School will be a nod to the days when the Grand Rapids Public Museum was owned and operated by GRPS which originally stored the collection at Central High School. He added that partnering with Downtown Grand Rapids Inc. makes sense as the city still owns the museum’s buildings and land. “We’ll be using 160 years worth of donations from this community – some 250,000 of them by conservative estimates – for the highest and best purpose, for the thing this community values most and that’s education,” Robertson said. The Museum School is targeted for a fall 2015 opening with 60 sixth graders with an additional grade level added each year up to the 12th grade. Sixth, seventh and eighth grade classes will be housed at the Van Andel Museum Center, 272 Pearl St. NW, with the higher grades located at the old museum site, 54 Jefferson Ave. SE. The district will begin taking applications in October. A computerized lottery will be used to select students, though interviews will be conducted with the families of potential to explain the high level of parental involvement expected. The old Jefferson Avenue locationwill require a multi-million dollar renovation. District spokesman John Helmholdt said partnering with the DDA and Downtown Grand Rapids Inc. may allow for funding options not typically available to schools.